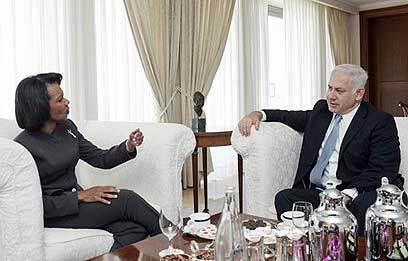 Wooing centrist voters: Likud Chairman Benjamin Netanyahu told United States Secretary of State Condoleezza Rice Friday that he intends to adopt a new peace model should he be elected as Israel's next prime minister. Netanyahu told Rice his model will combine diplomatic peace with economic peace, coupled with "accelerated development." He stressed that the peace model will be premised on improvement on the grassroots level and that would then move up to the leadership level. The Likud chairman was referring to economic and trade ties between Israel and its neighbors that would ultimately prompt peace on the diplomatic front as well. His meeting with Rice in Jerusalem lasted 45 minutes. During the meeting, the opposition chairman also expressed his gratitude to the Bush Administration, and specifically to the secretary of the state, for the American efforts to advance the Middle Eastern peace process. The two figures also discussed the Iranian threat. Earlier Friday, the Iranian nuclear threat was also addressed by Defense Minister Ehud Barak, who said that Israel is convinced that Tehran is still pursuing nuclear weapons, while simultaneously deceiving the world via negotiations. Speaking after his own meeting with Rice, Barak said he believed that the leaders of the free world are aware of these developments, which must be taken into account in any future decision. "As for Israel, we have said before that all options are open," he said. See all talkbacks "Netanyahu offers new peace vision"